^ Reuther, Walter; Leon Dexter Batchelor, E. Clair Calavan, Herbert John Webber, Glenn E. Carman, Robert G Platt (June 1989). 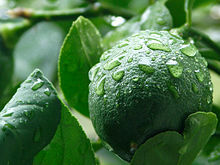 Citrus Industry: Crop Protection. University of California. p. 195. ISBN 0-931876-24-9.